A while back, a friend of mine acquired an Atari 2600 and wanted me to test it out and clean it up, knowing I love doing that sort of thing. After I got the system running, I was playing through some games when it dawned on me, sitting there with the joystick and it’s single button was the best feeling I’ve had playing Atari 2600 games in quite a while! I own software for PC and my other consoles that allows me to play most of my favorite Atari 2600 games, since I can’t play them on my own (broken) system, and it just isn’t the same. When I play Activision Anthology on my PS2, sometimes I get confused as to what to press because the PS2 controller has more buttons (and 2 analog sticks! ), not to mention the shoulder buttons being mapped to emulate the switches on the Atari deck. The Atari was super simplistic with merely 4 to 8 directions and 1 button. If I’m playing a game designed for the PS2 there is no confusion, it all comes naturally with the mental understanding that this game has a feature for most if not all the buttons on the controller. Video games have come a long way since the Atari 2600 and thankfully so, but when they try to reach back there seems to be a disconnection within that transition. Don’t misunderstand me, I believe it is a great idea to offer classic video games on next gen consoles. I believe it helps keep the classics alive and bring them to a new audience that may not have been exposed to them beforehand or possibly can’t find or wouldn’t be caught dead with the classic systems these games were programmed for. There are many pros and cons for each side and I can understand them both equally, but I still feel that personally I would rather take the time to hunt down an old system and it’s software so that I can connect with the originality over playing them on a console they were never designed to be played on. Emulation and software remakes have done a lot of good for classic video gaming, with companies like Atari, Activision, Namco and many others releasing multiple (albeit usually the same games over and over again) compilations of their classic games for many of the next gen consoles. I use emulation as a learning tool, sometimes they might offer games I’ve never heard of or haven’t seen before so I try them out and find out whether its a game I would like to add to my collection or not. 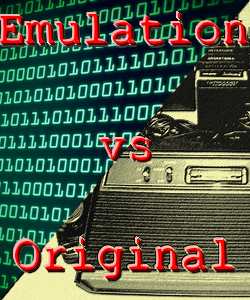 While I must admit, I do own them, will probably continue to buy them and for the most part thoroughly enjoy them, I’m simply saying that emulations and software remakes are not a perfect alternative to the decades of bliss and simplicity that the original hardware has provided before.